Aguijjim (often misspelled as agujjim) is a braised spicy monkfish dish. When cooked, the ugly fish takes an unexpected gourmet turn with a delicate texture. Monkfish, or anglerfish, is usually described as one of the ugliest fish in the deep ocean. Koreans often call it “devil fish” due to its huge head and tiny eyes. An enormous mouth filled with numerous needle-like teeth completes its gruesome appearance. Surprisingly, the fish’s texture is quite the opposite of its appearance. The white flesh beneath the black skin is tender and soft. The texture is often described as being similar to lobster meat. Aguijjim is served in small, bite-sized pieces that are usually bone-in and have the skin left on. The slimy fish skin is often regarded as a delicacy for its texture, along with the stomach, which tastes similar to tripe. The flesh is moist as the fish is braised before being stir-fried with a thick sauce of Korean red chili pepper flakes. The dish’s fiery red visual warns of spiciness. Many enjoy spicy aguijjim, especially when having the dish as a late-night snack to go with drinks. Aguijjim is basically braised monkfish lying under a mountain of bean sprouts that complement the dish, with the crisp texture contrasting with the moist fish meat. There are also hidden mideodeok, or sea squirts, in aguijjim. When chewed, mideodeok squirts water along with a briny ocean flavor. 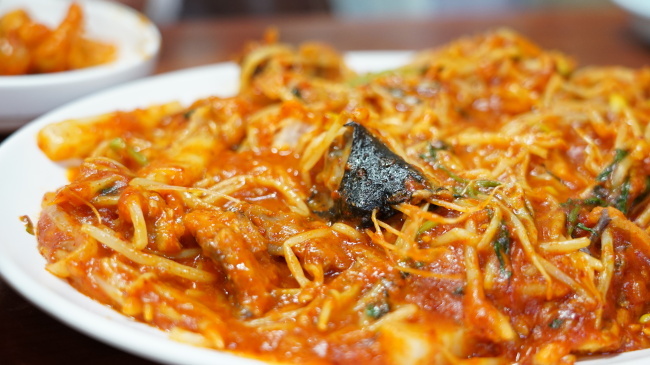 The dish originated from Masan, South Gyeongsang Province. In the city of Masan, there is an Aguijjim Street, with restaurants specializing in the dish lined up on each side of the road. In Seoul, there is an Aguijjim Street near Nakwon Instrument Arcade in Insa-dong. Monkfish is called “agui” in Korean, referring to the starving, greedy spirit in Buddhism. Despite having a large mouth, the ghost has a needlelike throat, and is always starving as a result. The fish was named after the evil spirit due to its large mouth.